One of our volunteers once said to me, “Farming ain’t for wimps.” Ain’t that the truth! After spending three years farming with a small nonprofit, I know the hard work farmers put into growing their crops. I know what it takes to feed a community. 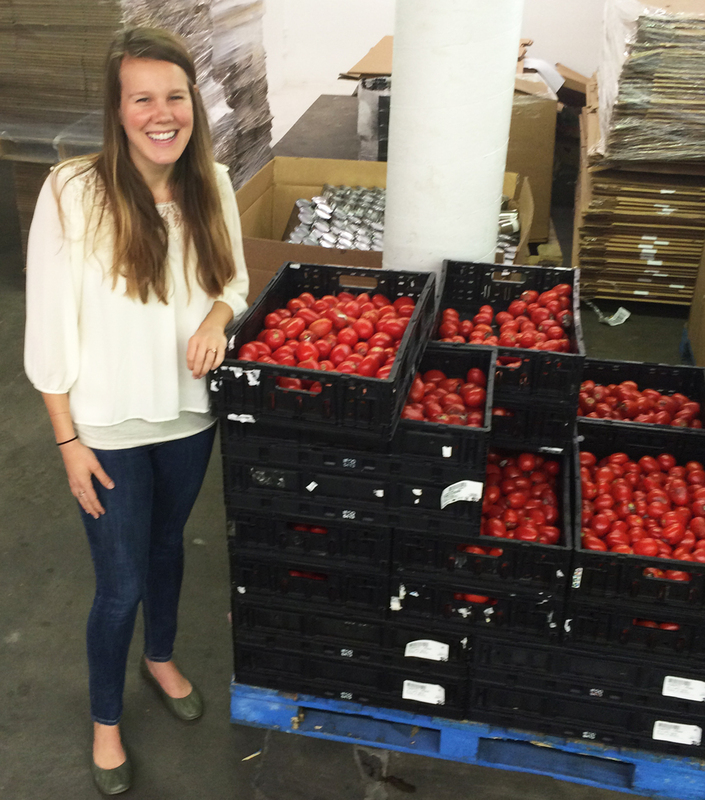 Mari Carl, Food Resource Coordinator, stands next to fresh tomatoes in our Wilmington Branch. Across central and eastern North Carolina, you’ll find farms of all different types. Having grown up on a farm, this is one of my favorite things about traveling throughout our service area. But what you don’t see as you pass by their fields is that many of these local farmers are helping us fight hunger throughout the year with their generous donations of fresh produce. Whether it’s sweet potatoes, collard greens, watermelons, squash, or even sweet corn, these growers are making a huge impact by allowing us to increase access to produce for the almost 650,000 people struggling with food insecurity in our region. For more than 15 years, these partnerships have provided millions of pounds of fresh and locally grown produce to our most vulnerable neighbors. Last year, a third of the produce we distributed came from North Carolina farms. Produce season is almost here, and I’ll be working hard with my Food Resources team to grow our relationships with local farmers. Because of their compassion, hard work, and generosity, we can put more nutritious produce on the tables of families in need. And to me, that makes all the difference in the world. 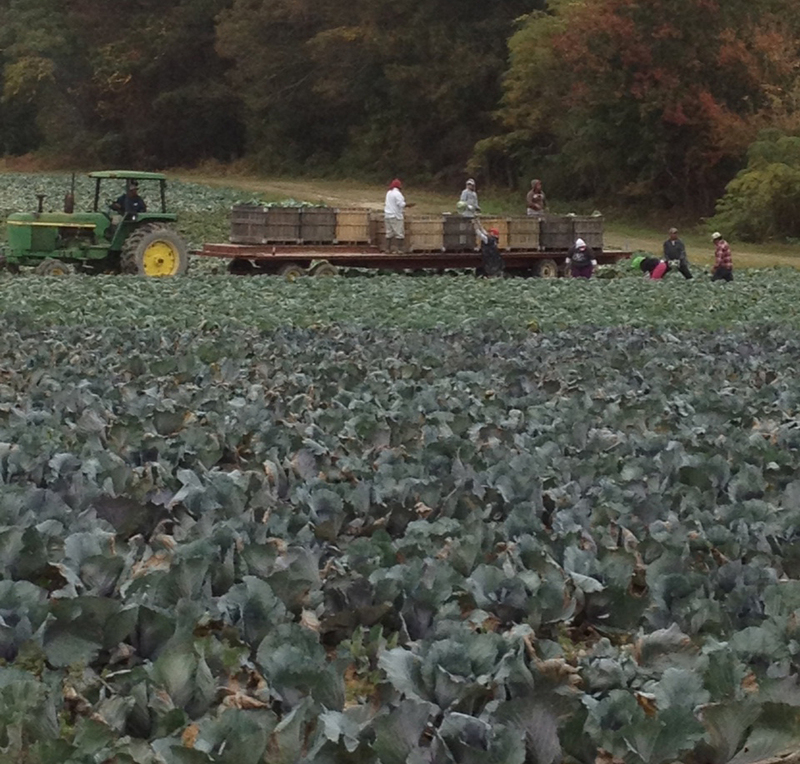 Farmers and volunteers glean cabbage at a local farm.